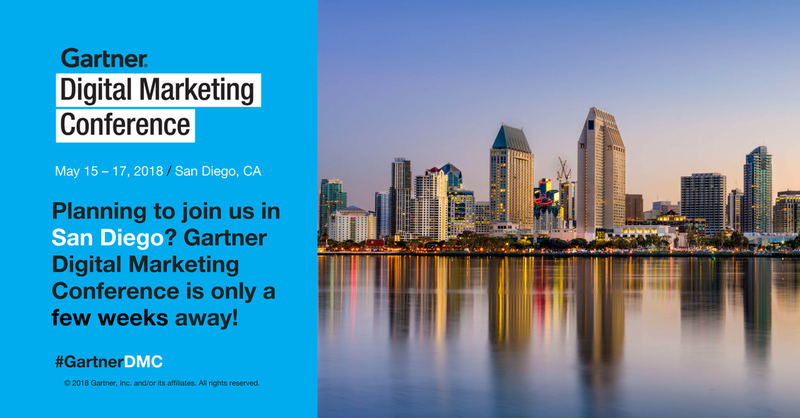 After three days at Gartner’s annual Digital Marketing conference in San Diego, I am more optimistic than ever that the future of marketing will be highly personalized engagement on multiple channels from mobile and bots to voice and even video. At the heart of this will live next-generation Artificial Intelligence (AI) that will drive better ROI and create deeper trust between brands and customers. 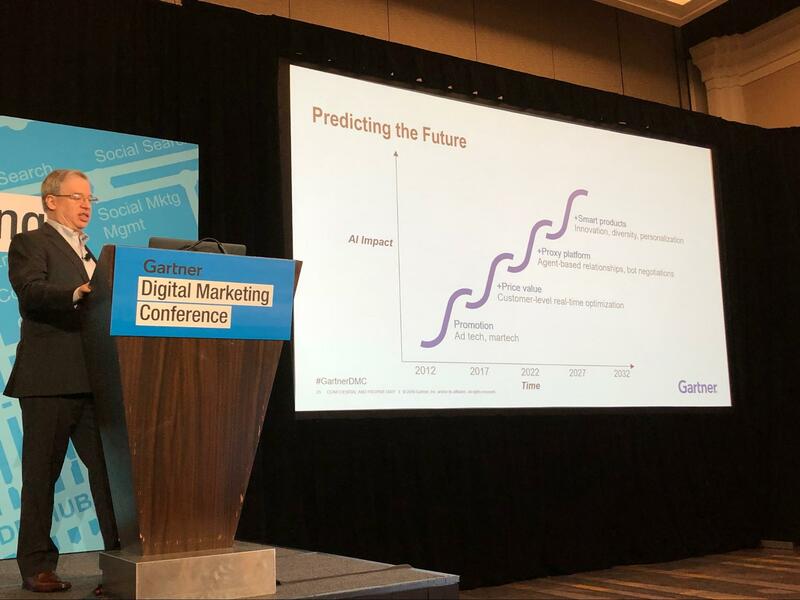 The Gartner Digital Marketing conference was conceived to empower marketing executives with strategies, real-world success stories and vision of how to use marketing technology to achieve their goals in the future. This year, the conference had grown to over 1,400 marketing leaders from around the world who came the learn about best practices, market insights and new vendors and tools. I expect that next year, Gartner will have to find a bigger venue as this will grow even bigger. If you’re disappointed you missed the event, fear not. Here are the top takeaways from Gartner’s Digital Marketing conference. While I am a big fan of looking into the future of technology and chatting about how hyperloops will bypass Bay Bridge traffic and how robots will cook for us, Gartner’s analyst sessions concentrated on the real problems that marketers face and how they should plan for the real future. In this, Gartner analysts did not disappoint. While they challenged the audience to ponder the future of marketing, AI-driven conversations, and the impact of Blockchain, almost all the advice was on achieving incremental wins and calculating your impact. Every story was backed by real-world examples of brands already implementing new technologies — and in some cases, failures, which also made for valuable insights. I was a bit surprised by some of the findings and predictions as well. For one, the adoption and speed of voice-driven conversations is becoming a reality much faster than I anticipated. By the end of 2017, there were more than 40,000 Alexa skills alone and more than 44 million Alexa and Google Home devices sold. Yes, not all Alexa and Google skills are perfect. But this is an amazing push by brands into a new and unknown channel, where there are no real ROI numbers yet to show that voice will be a winner. The answer may be that more brands are now willing to experiment early with technology and feel more comfortable testing new channels like voice and bots — all to create differentiation. Gartner predicts that by 2021, early adopter brands that redesign their websites to support visuals and voice search will increase digital commerce revenues by 30 percent. And don’t forget that Google’s Assistant app and Siri do not require a smart speaker to interact with. Instead, you can use it on your phone, which makes it much handier for people on the go. But its presence on your mobile phone also gives it a second advantage: more accurate and relevant user data, because Google knows your location, movement, and app habits — which a smart speaker currently can’t. AI and machine learning will be part of the marketing future whether we like it or not. Gartner analyst Andrew Frank is predicting that future marketing systems will rely on more and more AI to optimize engagement with the customer — ultimately creating personalized conversations. It is clear that the future of digital business-to-consumer (B2C) marketing will be a multi-channel, personalized conversation between brand and consumer. Finding the right channel, the optimal time to deliver a message, and creating more relevant offers can only be achieved through the power of artificial intelligence and machine learning — at scale. In fact, future marketing systems need to recognize that marketing can be initiated by the customer and not only by the brand. To keep up, I’m convinced marketers will need better first-party data that comes married to third-party data, so that they can begin creating more accurate 360-degree customer profiles. But that’s just to start. We’ll then need to rely on algorithms to optimize the user journey and engagement. According to Andrew Frank, luxury lingerie maker Cosabella is already getting a head start. Cosabella is using several separate AI-powered systems to optimize targeted media, one-on-one promotions, and their personal catalog. The result: An revenue increase of over $480K and Return On Advertising Spend (ROAS) of 240 percent. Artificial intelligence and machine learning will be part of everything, from testing and personalization to predictive analytics and real-time conversations. Most analysts would remind you, however, that you can’t rely only on third-party data, and that the quality of your AI and machine learning improvements are strongly correlated to the quality and size of your data. Because I am in the mobile space, I wanted to know what Gartner thinks about the future of mobile marketing. Again, mobile was part of the overall conversation in many of the sessions as one of the go-to channels for investments, conversation, and conversion with customers. 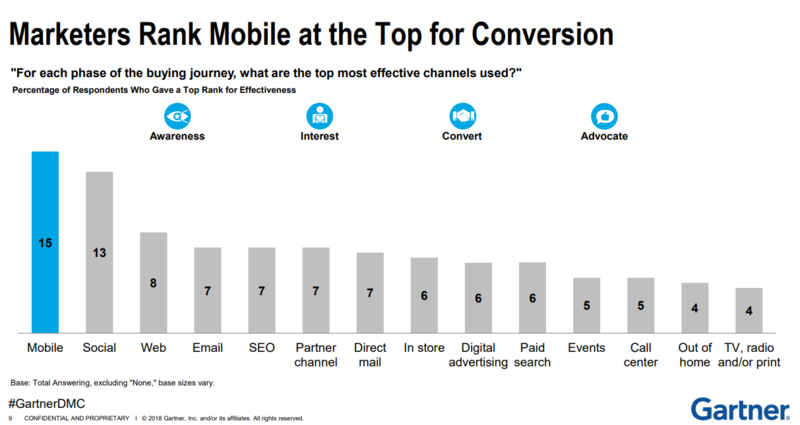 In fact, in a recent Gartner marketing survey, marketers ranked mobile as their topmost effective channel used for conversion. But surprisingly, one of my biggest takeaway for mobile at Gartner’s conference: Native mobile apps aren’t the only player anymore. Mobile web and progressive web apps (PWAs) now deliver a very rich user engagement experience in real-time that is getting closer to what only native apps were able to give us in the past. According to Charles Golvin who covers the mobile vendors, companies like Lyft are starting to push their web mobile service to new customers who no longer need to download the app to have the same user experience. New browser support for mobile web apps will blur the line between native and web with the latest browsers, faster handsets, and better connectivity in the future. Another big change in mobile apps is the growth of the “super apps.” Mobile apps like WeChat, WhatsApp, and Facebook Messenger have added new “apps” inside them to allow its users to not only connect with friends, but to also make payments, shop, chat, and even video message each other. This helps apps continue to engage their audiences as they scale — WeChat alone has been reported to have over one billion users and growing. As new technology, like augmented reality (AR) and virtual reality (VR), are added to smartphones, where users can experience live NBA playoffs, interactive video games, or the latest cable shows, users will spend more and more time on their devices. Mobile is becoming the center of the user identity that can give brands better and more accurate data and allow them to target customers in ways that many marketers only dreamed of just few years ago. Another Gartner survey showed that marketers are now also allocating 12 percent of their marketing budgets for the mobile channel, which tops web, social, e-mail, digital, event, and SEO. As more and more customers move from brick and mortar to online to mobile-centric and later to mobile-first, marketers will increase their investments in mobile and will become even more dependent on it once they realize the advantages of real-time mobile data and engagement to other channels. The future of mobile marketing looks very bright from where I am standing. 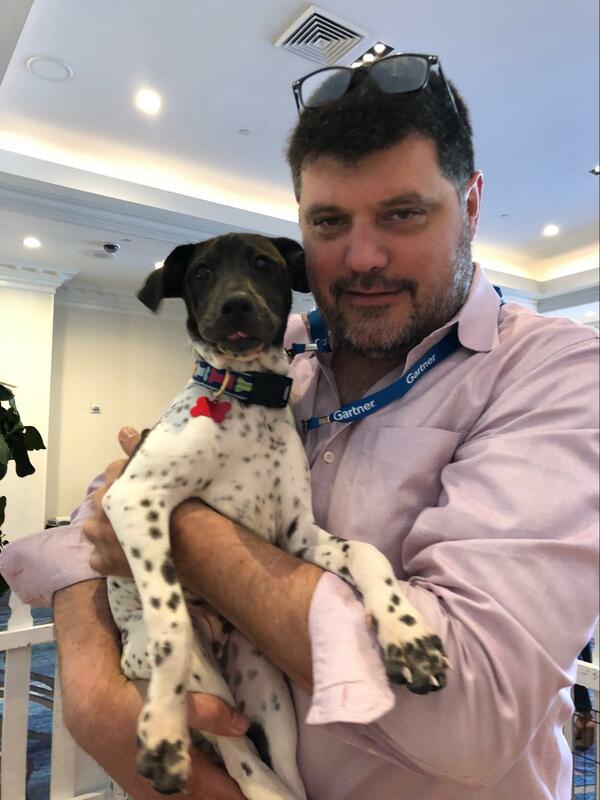 As a big animal lover and an activist, I just want to thank the Gartner event team for allowing once again the puppy booth sponsored by SAS at the conference. This is a lovely idea that helps fund a local shelter and brings awareness for the dogs in need of a home. No mobile app or AI can give you the satisfaction of hugging a puppy after all. According to Gartner, the future of digital marketing is looking brighter, with higher budgets, more integrated systems,and data-driven solutions that will help brands make better decisions, optimize offers, and deliver one-on-one personalization that can reach their customers wherever they are — on their mobile phones, smart speakers, cars, or TVs. Mobile engagement will grow with or without the power of apps and smart voice and maybe video assistants will take a central stage in the future of conversations between customers and brands. Only time will tell how fast we will experience these future innovations ourselves, but after listening and speaking to many of my former colleagues at Gartner I am confident that this will happen soon and it will be very exciting.